For best results, use Chrome. Click the loose brick on the right wall under the columns to zoom in. Click the brick to remove it, revealing the Key. Use the Key from your inventory to unlock the front door. Go through the open door into the foyer. Click the painting above the stairs to zoom in. Take the Ripped Piece of Paper tucked into the upper left side of the frame. Go up the stairs to the hallway, then go into the second door on the right into the child's bedroom. Take the Goldfish Bowl on the bedside table. Click under the bed to zoom in. Take the Chess Piece on the floor. Go back to the hallway then into the first door on the right to enter the grandfather's bedroom. Click the framed butterflies on the left wall to zoom in. Take the Jewelled Butterfly at the upper right corner. Click the drawing on the wall to the left of the bed for a closer look. Click the chessboard to zoom in. Add the Chess Piece from your inventory to the board. Take the Silver Key from the revealed cache. Use the Silver Key from your inventory on the door to the far left. Go up the stairs into the attic. Click the large trunk to zoom in. 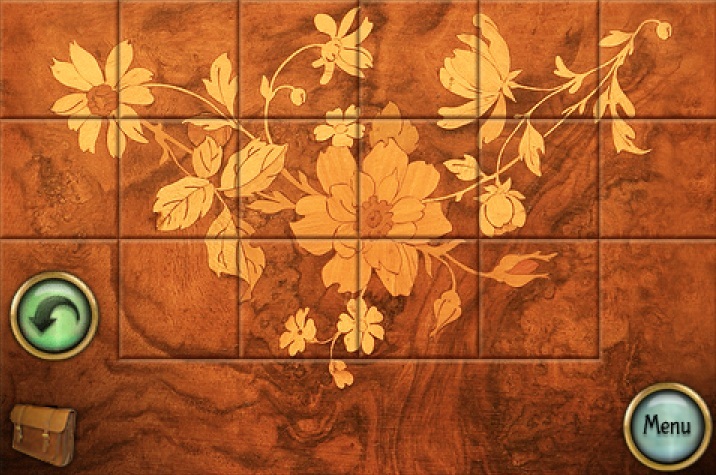 Rotate the tiles to complete the image of the flowers. Once the puzzle is solved, the tiles will slide open revealing a butterfly shaped recess. Place the Jewelled Butterfly from your inventory into the space. Click the trunk to open it, then click it again to look inside. Take the Magnet on a String inside the trunk. Note the four runes written on the bottom. Click the upper right corner of the rug to lift it, revealing a grate on the floor. Click the grate to zoom in. Use the Magnet on a String from your inventory on the grate to receive the Tuning Fork. Go through the lounge to the kitchen, out the door to the yard, and then forward to the shed. Click the pile of wood to take the Log. Click the plaque on the wall to zoom in. Use the Tuning Fork from your inventory on the speaker under the ear. Go through the open door inside the shed. Take the Wooden Mallet and the Carved Falcon on top of the work table. Click the falcons on top of the fireplace to zoom in. 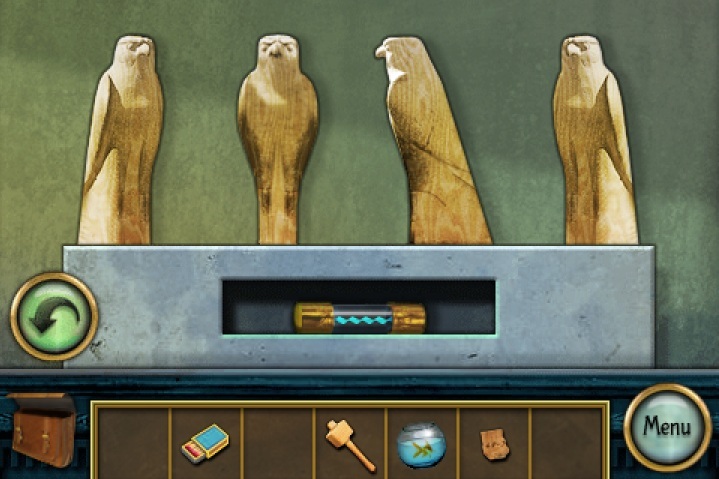 Add the Carved Falcon from your inventory into the third space on the mantle. Turn the falcons according to the drawing in the grandfather's bedroom. Starting with the falcon on the far left, turn the first one facing Southeast, the second facing South, the third facing West, and the fourth facing Southwest. Take the Fuse from the hidden compartment. Return to the grandfather's bedroom. Use the Wooden Mallet from your inventory to smash the piggy bank. Click the piggy bank to zoom in and take the Brass Token. Go back to the foyer and then left to the dining room. Take the box of Matches on the table. Click the gumball machine on the table to zoom in. Use the Brass Token from your inventory on the coinslot. Turn the handle and take the heart-shaped Jewel from the dispenser. Go right at the end of the hallway to face the hidden door. Place the Jewel from your inventory into the notch at the bottom of the right gargoyle. Click the opened cache to zoom in. Take the silver Knob and the Ice Pick. Put the Knob from your inventory inside the hole of the drawer to the left of the fridge. Click the drawer to look inside and take the Rusty Key. Click the freezer to open it. Use the Ice Pick from your inventory on the block of ice to reveal the Wrench. Go back to the hallway and then through the rear door into the bathroom. Use the Wrench from your inventory on the large bolt on the wall. Click the wrench to turn it, revealing a secret passage. Go through the open door into the passageway. Click the door of the fusebox to open it. Place the Fuse from your inventory inside the box. Click the lever to the left of the fusebox to lift the wall. Go through the revealed doorway into the study. Take the Golden Key on the desk. Click the door on the left to open it. Go back to the passageway. Click the lever to lower the wall again. Return to the hallway then go through the door at the end of the hall to re-enter the study. Click the poster on the wall blocking the secret passageway to zoom in. Note the message at the bottom, "Love is the key to the world"
Click the magnets on the fridge to zoom in. Note the colors of the letters that make up the word "Love"
L is Green, O is orange, V is red, and E is purple. Click the globe by the fireplace to zoom in. Turn the handles on the dials to change the colors so that they match the colors of the fridge magnets in L-O-V-E order (Green, Orange, Red, Purple). Once the puzzle is solved the globe will split open, revealing the Sealed Wooden Box. Place the Log from your inventory into the fireplace. Light the log with the Matches. Add the Sealed Wooden Box to the fire. Click the third step on the stairway to zoom in. Use the Golden Key from your inventory on the keyhole inside the stair. Take the Ornate Rod from the secret cache. Return to the yard outside the kitchen door. Click the large stump in the grass to zoom in. Use the Ornate Rod from your inventory on the metal socket in the center of the stump. Click the stump again to zoom in, then go down the ladder to the cave. Click the stone pedestal in the center of the room to zoom in. 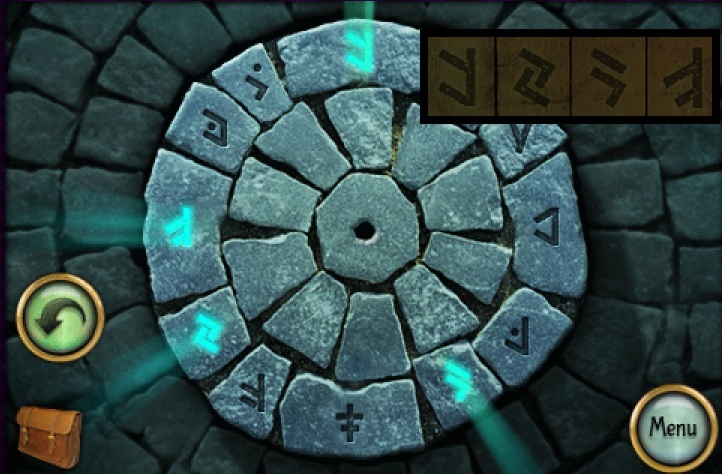 Click the runes in the circle that match the four runes found at the bottom of the trunk in the attic. Once the puzzle is solved, two beams of light will come out from the center of the circle. Note the position of the lights resembles the position of the hands on a clock, if the time was about 8:25. Click the cuckoo clock on the wall to zoom in. Turn the dials to move the minute hands on the face of the clock. The left dial moves the hour hand, the right dial moves the minute hand. Set the time to match the beams of light from the cave at 8:25. Once the clock is set the cuckoo will come out, revealing the Stopper. Click the bathtub to zoom in. Use the Stopper from your inventory to plug the drain. Click the faucet to fill the tub with water. Use the Goldfish Bowl on the tub full of water to release the goldfish and receive an Empty Bowl. Use the Empty Bowl on the tub to make it a Bowl of Water. Use the Bowl of Water to douse the flame. Click the fireplace to zoom in. Take the 5 Ounce Weight from the ashes. Use the Rusty Key from your inventory on the cabinet on top of the work table. Take the second piece of ripped paper inside the cabinet, completing the Combination. Go back to the study. Use the 5 Ounce Weight from your inventory on the left side of the scale on the desk. Click the revealed safe behind the dog painting to zoom in. 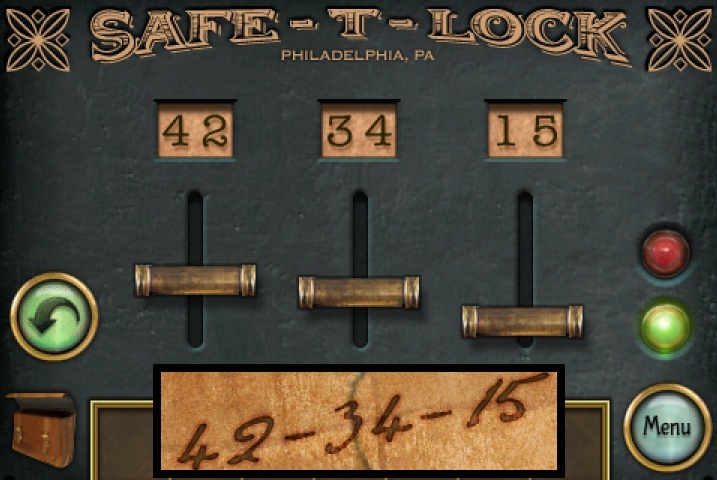 Enter in the Combination from your inventory to the numbers on the safe. Take the Iron Key from the opened wall safe. Use the Iron Key from your inventory on the door behind the stairs. Go through the open door to the basement. Click the blue door to zoom in. 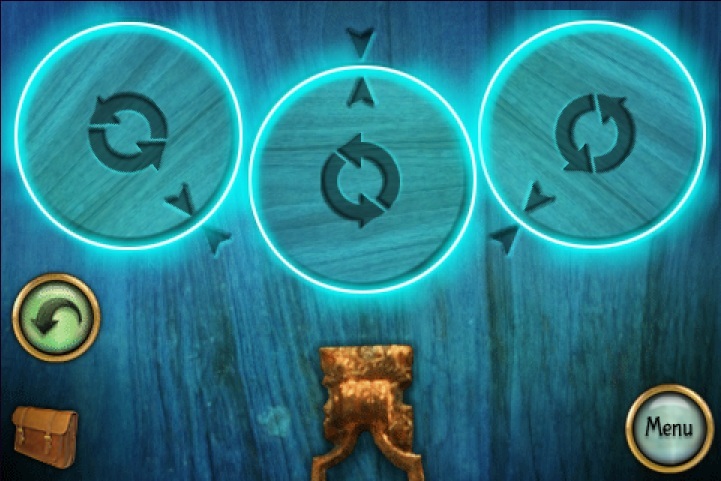 To open the door, rotate the three discs so the arrow inside each circle lines up with the adjacent arrow outside the circle. Starting from the left Disc #1 rotates all three circles, Disc #2 rotates 1 and 2, and Disc #3 rotates 2 and 3. If the circle is stuck glowing, align the arrows of the glowing circle, then rotate a different disc to move the glowing circle away from the arrow and it will fade back to normal. Once the puzzle is solved, go through the open door. It's not coming up. Sometimes I get the ad, sometimes not. Then just a blue background image. I have Firefox 3.6. Very nice! I really enjoyed that. Am now touring the house in vain...help? Have you explored all of upstairs? Anyone figure out the globe? That got it. I've been procrastinating on updating Firefox. Thanks Jay. I figured out the globe without closing the secret passageway--a clue is in the caption for the dog painting--but I don't know what to do with the prize. Stuck with a fishbowl, a sealed cube, a combo, and some matches. Phew, made it! Thanks to stupidcheese boy, was stuck for ages on the globe. Good game. goldfish/fire/bathtub nexus. Is there a stopper for the tub, is that what I'm missing? I wish it would just let me sacrifice the freakin' fish to put out the fire to get the burnt cube thingy! Quite simply, this was an AMAZING game! The closest thing to a free Mystery Case File Game you can find. For those unfamiliar, the MCF series is the epitome of point and click games. There was no changing cursor, but there was also no pixel hunting. The areas that you needed to click were so obvious that a changing cursor would have been unnecessary and made the game a little too simple. The puzzles flowed logically and although you had to think a little, nothing made you beat your head against the wall. The visuals and sounds were nice and atmospheric and if I had any complaint it was with the constant fade ins and outs, but they did not distract from the overall experience. Kudos Fire Maple! I hope to see more from you in the (near?) future. Kranin, Think about what the poster on the other side of the secret door into the study said. Aaa-. Where to find time for clock ? I can't figure out what to do with the tree stump. Stuck. Waiting for a walk-through or a hint for idiots like me who can't figure out the clocks, birds, combinations or symbols. Just wandering around trying to pour my fish into various things. underneath the far right corner of the rug in the main hallway. Infant Tyrone , about birds. Have you seen the picture of car with four wheels ? Look at this wheels carefully - that is the hint for birds. Globe. Hint is word Study. I see the color letters on fridge - probably it is the hint too. but what is the Word ? the wheels have eight segments, and the birds only five positions, it didn't make any sense. 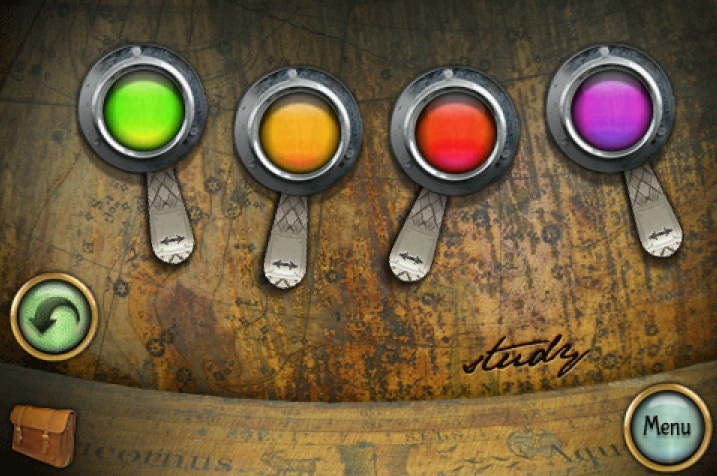 I have a feeling the clock and the globe colors may be the same not-quite-intuitive puzzle. Infant Tyrone, i found the clock puzzle. yes. I have solved the GLOBE !!. Remember the electric door you opened on the second floor to enter the hidden room ? Close this door, walk around and read the poster - hint: the word LOVE. Use the fridge to decode it. what's the deal? IE 9,my browser, is HTML5 so why can't i use it? weird. It freezes after the letter, and I have FF5/WinXP. Can I ask what exactly this format is? I have a feeling the default browser was somehow changed for this type of file, but I can't find the program to disassociate it from the IE-type browser. Not really sure *how* to do it either, since it's a file that loads, not a file that downloads. I have this problem with another game, too, and I think it's HTML5. I was playing the steampunk game earlier this month with no problem, but with someone else on this machine, I'm not really sure what to do. Thanks in advance. This game was really fun to play on my nook Color. The screen is much bigger than my iphone, and the touchscreen worked really well for the gameplay. I put water in the empty fishbowl and used it to put out the fire in the fireplace. Nothing happened. What am I supposed to do with the friggin' bowl? This was GREAT! I loved everything about it. This is what a point-and-click should be! At one point, I thought about reading the comments because I was stumped ... but I stuck it out and was able to finish. Pretty good game. I beat it, but my system is apparently ill equipped to run it, so it was painful to go through. I don't think I'll be writing a walkthrough, as that would require I play through it again. This game was very annoying to play. The constant painfully slow iris wipe transitions made me want to not interact with any objects anywhere, and the occasional slow room slides weren't much better. If it had used instant transitions, given all the back-and-forth-in-and-out it makes you go through, it would have been a great game. 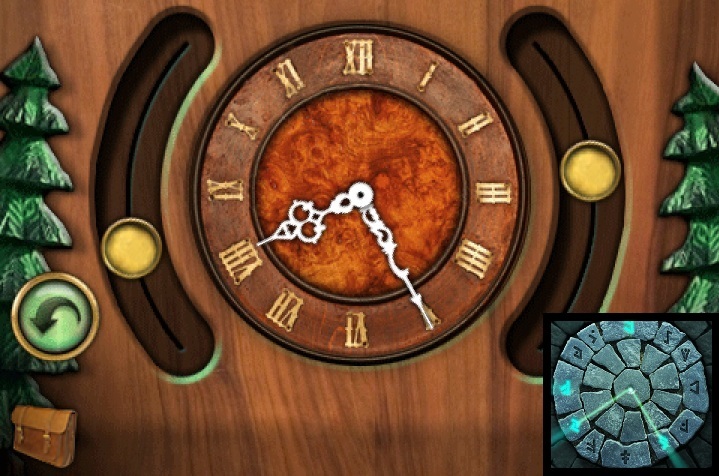 Even after viewing the walkthrough, I don't understand where the clue for the clock was supposed to have come from. I'm only complaining about these inconsistencies because otherwise I was having a phenomenal gaming experience. Everything up to those sticking points was above and beyond the call of duty! I had the same thing as Paul ... IE9 does html5. But not very well. I went to a test page, and it scored 141 out of 450.
align the first, the left most, inner arrow, with the outside one. don't fiddle with the center circle at all. instead try aligning the right most circle with its outside arrow, and the center one will align itself. all three of them must be glowing and the door will only open if all the inner and outer arrows of each circle are facing each other. hello all, i'm new to this. so apologies in advance if my spoiler's all messed up. I wanted to like this game, but it just wasn't possible. The puzzles were fine, though nothing special, but the unresponsive controls and the irritating, lagging animation at every scene change required me to click three or four times for each one click that should have been required. Games aren't fun when they make you want to put your fist through your monitor. the clue to the globe is quite simple. the clue is in the secret room, behind the door that you open in the passageway with a handle after putting the fuse in place. once you're done with the room use the handle in the passage to close the and then walk back in from the side with the heart rubies. behind the door on the poster it says Love is the key to the world. Globe= World. the Use the fridge magnets to spell oyt love and use the Colours that spell out LOVE on the globe. ps i suppose you need to first find the clue and then solve the puzzle. yes, i know, the spoiler above is almost like a short story. light the fire again. You will need the fire to open the wooden cube founded in the globe. lines of light in the cave shows you the key to the clock. The last door was frustrating. I finished it and all 3 circles were glowing, but the door didn't open. I had to spin the circles around so they were reset basically. Then start over and finally after making them all glow 3 times it registered and the door opened. There seems to be a problem with saved games. After I click "Continue," the game loads to a black screen with only the inventory and menu icons showing. Music plays, I can open the inventory and return to the menu, but I can't play the game. After resetting my game, it loaded properly. Update - I changed the default browser on Windows via "Add or Remove Programs" > Custom > Choose My Default Web Browser. Sadly, this did nothing for getting me beyond the letter screen. This machine is maxed out, there is no way I can add yet another browser to it. Thanks Jay for the help. Game doesn't work for me either. 1) When clicking on the options on the title screen, it won't allow me to go back to the main screen. 2) I get stuck after the letter shows up right at the start of the game. Tried with Chrome 13.0.782.112 and Firefox 6 on Windows XP. Zero-K, I'm in the same boat. I've gotten them all glowing twice now, but no luck on the door opening. Now two of the circles are 'stuck' glowing no matter where they point, so I'm just going to have to give up. Extremely frustrating. I'm using Safari for mac (the game wouldn't work at all in Chrome). all 3 circles need to be touching the arrow. this was tricky to me too but i think once once you get certain ones placed in a ceertain position, the rest will fall into place. I hope someone will at least make a walkthrough for the final puzzle. It is hard to get them aligned just right. I agree that the animation transitions between scenes look great the first time, but they don't half irritate after a little while. your grandfather alive and well. He tells you that he discovered time travel, and all the puzzles were to make sure no-one but you found him and his secret. The end. Guys, please don't forget to use "spoiler" tags to hide spoiler-revealing clues from readers who don't want to see them. If you have questions on how to use spoilers, please read our spoiler help guide. How do you open the stomp? What is the trick for setting the blue circles? and second dials. The third circle controls the second and third dial. I do not have a specific walkthrough on this but you need to just keep turning the dials until all 3 are on the arrow. All 3 circles will light up with or without them being set to the arrow,so that will give you an idea on where to make your next move,. If anyone has a specific walkthrough 9on this part, please post here. Go outside the Blue Door and you are out. Never mind! Got the circles. Ending was pretty anti-climatic, IMO. Hey Dora thanks for the Silent Hill 2 reference! Argh...think I've found a bug. At the very end after solving the circles, the doorway lit up but I clicked on the dark area to the right instead of the doorway and I'm now trapped in darkness forever! now why did i try putting the goldfish down the sink drain? there is no 5oz weight in the fireplace. I have doused the fire with the fresh water in the fish bowl and clicked and clicked the entire fireplace and all it says is there is a log in the fireplace. HELP????? This game was short lived. Is there a part 2? Could not enter the first two numbers on the lock in the study. I tried for half an hour but the numbers I needed would not appear no matter how carefully I tried to position the tumbler. I was able to get the last number. Any idea what I'm doing wrong? Have you found both pieces of paper to complete the combination 42-34-15? The first piece of paper is in the picture frame above the stairs in the Foyer, and the second piece is in the locked cabinet in the Shed. If you have the complete combination, it should work when you move the first two sliders. They can be a bit fussy, so make sure to move them very slowly in order not to skip any numbers. If you are still having difficulties after that, it may be linked to a technical issue or lag. Make sure you have the latest version of flash installed, clear your browser cache, and close any other applications you may have running. Have you tried running the game in a different browser? For some reason i cannot move the knobs, for the wall safe in the study, to the right numbers... anyone knows why that is happening to me? Read the spoiler comment just above your comment. I'm having the same problem with the fire. I dowse the flames and then it say, there is a log in the fireplace. So I light it again, dowse it again and still, there is a log in the fireplace. WTF??? Did you put the Sealed Wooden Box in the fire before dousing it with the water? (This is mentioned in the walkthrough at the Lounge area, after solving the globe puzzle) The point of the fireplace is to burn the box to destroy it, then douse the flames afterwards so you can take the Weight that was inside the box. Read the spoiler just above your comment. Solved the circles on the door in the basement... door does nothing??? Where is the gargoyle and the secret door at the right of the stairs it talks about? Help me please!! I am completely stuck. I have a fishbowl, matches and the paper with numbers on it. Someone help me! I have been in every room and tapped on everything. Have a look at the walkthrough above the comments! I have repeatedly made all the rings glow on the basement door and nothing happens. I try to open door, it doesn'[t open, I hit back to get full door to open it, but it doesn't open. Then I go back to the rings and do it all over again. What am I doing wrong??? im trying to use the red heart and i know you have put into one of the statues by the hallway door but there not there am i just looking in the wrong place.... Please Help!!! Check the basement segment of the walkthrough above the comments. There is a complete explanation and a screenshot. Have a look at the walkthrough above the comments. 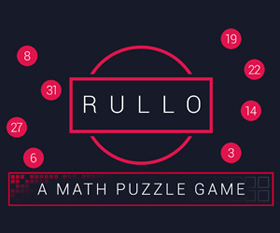 I solved everything but I'm still stuck on the last puzzle, even with the hints & walkthrough! Can someone help me out? So frustrating! rachel- Looking for the hallway with the gargoyles? Go up the stairs. Click on the wall inbetween the bathroom and little girls bedroom. It's actually a hallway. samantha Roberts- Look at my spoiler for rachel on finding the hallway with the gargoyles. Have a look at the walkthrough above the comments to see if you may have skipped a task that is keeping it from working. I would have NEVER finished this game. I guess my brain doesn't work right for these kinds of games! Thanks for the walk through! AWESOME game. . . FUN. . . .CAPTIVATING!!!!! My kids hope there are more planned. . . I made all 3 circles line up and glow, exactly like basement solution picture but the door does not open. Where do I find the ringtone for the warehouse ? when I set the clock at 8:25, nothing happens ......? Any idea how to get the Stopper? I dont know what to do, I'm stuck. I haven't gotten to the study, I haven't got the key for the stairs, I cant figure out the globe or the clock. I cant find the plug. If someone can help me or give me a hint I'd appreciate it. Have you been to the Cave area first? You should be able to get the Stopper if you've set the correct time on the clock, but only after viewing the example on the stone dial in the Cave. Refer to this screenshot for the solution. You may be encountering a slight bug previously mentioned by other commenters. If one circle is correctly positioned but then moves from that spot, it may appear to still be glowing even though it is actually incorrect. Refer to the Basement section of the Walkthrough above the comments for instructions on how to fix a broken glowing circle. Michelle, are you referring to the speaker on the outside wall of the Shed? Follow the instructions in the Walkthrough above the comments for a step-by-step guide to access that building. I'm playing on IPhone IOS5 and have completed the dining room and am now stuck in the hallway as I can't zoom in on the hidden door to use the Jewel, can anyone help?? Once i get to the hallway with the jewel, I cant seem to move to the right to go outside where the gargoyle is. Any help? Our walkthrough that is posted above the comments should help you, even if you are playing the game on your iPhone or iPad. Im playing on my Iphone and I can't figure out the clue on the clock, the bird and the globe.. I've got matches and ripped piece of paper... hays! I can't figure it the puzzle on the globe, where you tip the goldfish or where the plug for the bathtub is or how to get into the shed. Please help. Have you had a look at the Walkthrough above the comments? The solutions to all of those puzzles can be found there. Where do i find the log to put in the fireplace? Please consult the Walkthrough above the comments for the step-by-step guide to all of those puzzles. The Log is found in the wood pile outside the Shed. There is a new game out, longer better "the lost city" 2012!!! when i saw the grandpa, is that the end? for the globe: you go to the kitchen and look at the alphabet on the fridge the colours for the word love are the colours for the globe then you put the box in the fire and it burns. Now i think you have to put the fish in the bath so you can put the fish water in the fire but i dont know how HELP ME !!!!!!!! Got the time right but nothing happens!!! Help?! 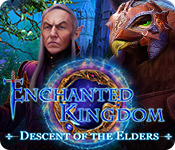 There is a walkthrough for the download PC version of the game posted above the comments. Did you skip the puzzle in the Cave area? The clock won't accept even the correct solution until after you've seen the clue in the Cave first. I've run into a problem, I made it to dousing the fire with the fishbowl w/out any help but was stuck for about 2 hours after, I came here looking for clues, it says to check the ashes but I can't. After I put out the fire it says "there is a log in the fireplace" and idk if I have to move it somehow, or if my game is glitched. Btw I'm playing on iPhone version if the game. It's not a glitch, sounds like you just skipped an earlier step. You need to first place the Sealed Wooden Box from your inventory into the lit fire. Douse the flame with the fishbowl water, then take the 5 Ounce Weight from the fireplace. Have you had a look at the Walkthrough above the comments? The answers to all of your questions can be found there. This game is awesome! :D I finished it just now and i played it for only 3hrs! Hahaha! I hope there's a part 2!! I got the right colors to the globe but it doesn't work! Is there a problem here? You didn't say which version of the game you are playing, but you might want to have a look at the walkthrough above the comments for some help. I have nearly completed the whole game but I am stuck on the last bit I can't get all the dials in the right place to open the door I have looked at the walk through but still can't get it!! Please help!! You may be experiencing a common bug that can cause a disc to stay lit even when it's in the incorrect position. Or is it the mechanics of the puzzle itself that's giving you trouble? The basic principal of the puzzle is that the arrows inside each of the three discs need to be touching points with the arrows outside of the circles. You can click and drag a disc to rotate it clockwise or counterclockwise, but that will also rotate at least one of the other circles. The easiest method I found was to adjust discs 3 and 2 first, then to align all three with disc 1. I'm playing on iPhone and am stuck in the hallway after collecting the jewel. I've followed the walk through but can't get to the gargoyle, can anyone help please? people pls !!! what to do with a wooden box???? Can anyone help. I'm playing the game on the iPhone and I've filled the fish bowl with water from the bathroom, but every time I try to douse the fire, it says "there's a log in the fireplace". I've checked the walk through and cannot see that I've missed anything. Can anyone help as I'm getting really frustrated now! It can be a bit tricky the first time to find the right spot in order to face the side doorway where you use the Gem. The best way to describe it would be to click the corner past the second door at the end of the right wall. Please refer to the Walkthrough above the comments to find the step-by-step instructions for using the Wooden Box. Did you remember to first place the Sealed Wooden Box from your inventory into the lit fire? After the box is in the fireplace, you can successfully douse the flame to find the 5 Ounce Weight. Please read the spoiler I addressed to Screwball 21 in the comment directly above yours. I put the fire out with fish bowl. But it tells me that it has a log in fireplace. How do I remove log? Will not zoom in to fireplace. Have you had a look at the third Lounge section in the walkthrough above the comments? You have to light the log with the matches and put the sealed wooden box inside the fire. Douse the flames with the water from the fish bowl, then you can take the 5 ounce weight that was in the box from the ashes. I'm getting the "This browser does not support HTML5. 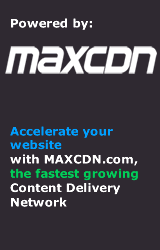 Try the latest version of Safari, Firefox, or Chrome." I'm using Firefox 19, which was released only this week (week of 20 February 2013), so I highly doubt the error message is correct. Well this finally loaded for me-- fairly enjoyable, tricksy in just the right spots. And not very tricksy at all in a few too many places. Great art. Not terrible grisly, however. Good for a few chuckles. I'm trying to figure out if I'm missing something. I have the right colors on the globe and it won't "spin open". Green, orange, red, purple. I have the log and the fire and the water but came to find the "spoiler" cause I was pretty sure I have the globe right but nothing is happening. I play on my HTC one and so far the whole game works great. You might want to have a look at the walkthrough above the comments, as well as read the other comments because a lot of them relate to the globe. I am stuck in darkness :X Bug in the game! !